SMPTE establishes quite rigorous standards for reference color analyzers. SMPTE 431-31 requires that chromaticity must be measured with a minimum accuracy of xy ±0.002 at or above 10 cd/m². The only devices capable of this are 5nm spectroradiometers. Until recently, this has meant devices from Photo Research and Minolta that cost between $15-$30,000.2 These prices put a reference device out of the range for everyone except established businesses. 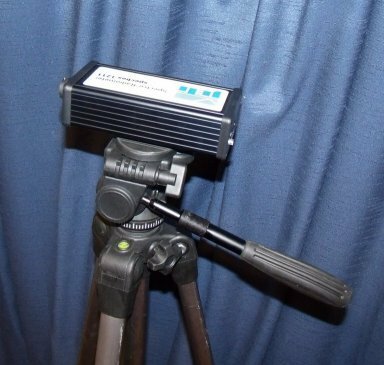 However, recently a German company by the name of JETI Technische Instrumente has offered a reference quality 5nm spectroradiometer, the Specbos 1201 for a considerably lower price. The JETI 1201 is a true reference instrument. I have been using it for a couple of years in this capacity. In addition to its inherent accuracy, it is an incredibly easy device to use. It is very small and portable and includes a nifty laser targeting system that makes precise aiming a breeze. This device suffers in comparison to the much more expensive devices available only in that it must be controlled by a PC. On the other hand, the Minolta and Photo Research spectros are standalone devices with high-quality optics and built-in LCD readouts. I never missed the lack of a standalone ability in the 1201. However, it does have a couple of shortcomings that makes its use as a regular field instrument quite impractical. First, it offers relatively low sensitivity. This means that when measuring sources with low light output, the 1201 becomes VERY slow. For example, reading 20% video window requires nearly 90 seconds. In comparison, readings of 70% video or above take 10 seconds or less. Thus, I found that it was best used for the purpose of correcting a tristimulus colorimeter, which then employed as the primary color analyzer. Second, with some colors the 1201's repeatability leaves something to be desired. Addressing these shortcomings, JETI has developed a new spectroradiometer, the Specbos 1211. The 1211 is larger than the 1201, but otherwise looks very much the same. What really distinguishes the 1211 from the 1201 is its sensitivity. By way of comparison, consider the following measurements. As you can see, the difference in low-light sensitivity and speed is dramatic. The 1211 reads a 20% window in about the same time the 1201 takes to read a 70% window. The 1201 won’t read 10% at all. The practical consequences of this are profound. The 1211 is perfectly suitable as a primary instrument. Measuring black level is the only calibration task for which it would not be suitable. However, it also includes a diffuser that allows you to use the device in illuminance mode. In this mode you read lux, and placed close enough to the projector lens it would read anything so long as the luminance was at or above 2 lux. There is one other technical difference between the 1211 and its smaller brother that bears mentioning. JETI discovered that the 1211 was so sensitive that its repeatability was affected by the refresh rate on some displays. Thus, they updated the unit to include support for refresh rate detection. With this feature the 1211's repeatability is excellent. Of course, with increased performance comes increased cost. The Specbos 1211 is about 30% more expensive than the 1201. However, this still places it several thousand dollars less than a 5nm PR-655 and less than half of a 5nm PR-670 or Minolta CS-2000. If you want a reference device as your primary measuring tool, the JETI 1211 is definitely the way to go. 1. This draft document was never made official and was subsequently withdrawn. Nonetheless, it offers a useful guide for professional standards. 2. I do not include the MicroSpec device simply because I have had no experience with it. 3. The real-world read time is double the integration time plus 3 seconds for processing overhead.